Before the HRS antenna became the default design for high power broadcasting in the 1950s, Sterba curtains were used. Sterba curtains are modest-gain single-band curtain array antennas. They are named after Ernest J. Sterba, who developed a simple shortwave curtain array for Bell Labs in the 1930s. Sterba curtain arrays are described in William Orr's Radio Handbook. Curtain arrays are a class of large multielement directional wire radio transmitting antennas, used in the shortwave radio bands. They are a type of reflective array antenna, consisting of multiple wire dipole antennas, suspended in a vertical plane, often in front of a "curtain" reflector made of a flat vertical screen of many long parallel wires. These are suspended by support wires strung between pairs of tall steel towers, up to 300 ft (90 m) high. They are used for long-distance skywave transmission; they transmit a beam of radio waves at a shallow angle into the sky just above the horizon, which is reflected by the ionosphere back to Earth beyond the horizon. Curtain antennas are mostly used by international short wave radio stations to broadcast to large areas at transcontinental distances. William (Bill) Ittner Orr (1919–2001) was an engineer, educator, and communicator. He was the American author of numerous amateur radio and radio engineering texts. He is best known as the author of The W6SAI Antenna Handbook and fondly remembered for the 1959 Radio Handbook. There are multiple feed arrangements for the Sterba curtain arrays, as with HRS type antennas. However, Sterba arrays provide a very limited gain-bandwidth system for the demands of modern shortwave broadcasting systems. Sterba curtain arrays preceded HRS type antennas by less than a decade. Only about 1% of high power HF broadcasting antennas in use in the 2000s are Sterba type curtain arrays. It is expected that by 2020 that all Sterba type curtain arrays will have been decommissioned. Amateur Radio operators do still build Sterba curtain arrays. 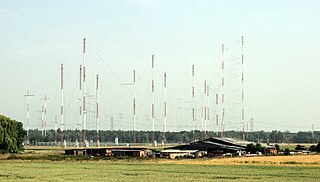 It can be argued that since amateur radio transmissions only take place in narrow bands, then a Sterba array remains a decent solution for their needs. In antenna theory, a phased array usually means an electronically scanned array, a computer-controlled array of antennas which creates a beam of radio waves that can be electronically steered to point in different directions without moving the antennas. In an array antenna, the radio frequency current from the transmitter is fed to the individual antennas with the correct phase relationship so that the radio waves from the separate antennas add together to increase the radiation in a desired direction, while cancelling to suppress radiation in undesired directions. In a phased array, the power from the transmitter is fed to the antennas through devices called phase shifters, controlled by a computer system, which can alter the phase electronically, thus steering the beam of radio waves to a different direction. Since the array must consist of many small antennas to achieve high gain, phased arrays are mainly practical at the high frequency end of the radio spectrum, in the UHF and microwave bands, in which the antenna elements are conveniently small. Very high frequency (VHF) is the ITU designation for the range of radio frequency electromagnetic waves from 30 to 300 megahertz (MHz), with corresponding wavelengths of ten meters to one meter. Frequencies immediately below VHF are denoted high frequency (HF), and the next higher frequencies are known as ultra high frequency (UHF). Ultra high frequency (UHF) is the ITU designation for radio frequencies in the range between 300 megahertz (MHz) and 3 gigahertz (GHz), also known as the decimetre band as the wavelengths range from one meter to one tenth of a meter. Radio waves with frequencies above the UHF band fall into the super-high frequency (SHF) or microwave frequency range. Lower frequency signals fall into the VHF or lower bands. UHF radio waves propagate mainly by line of sight; they are blocked by hills and large buildings although the transmission through building walls is strong enough for indoor reception. They are used for television broadcasting, cell phones, satellite communication including GPS, personal radio services including Wi-Fi and Bluetooth, walkie-talkies, cordless phones, and numerous other applications. Medium frequency (MF) is the ITU designation for radio frequencies (RF) in the range of 300 kilohertz (kHz) to 3 megahertz (MHz). Part of this band is the medium wave (MW) AM broadcast band. The MF band is also known as the hectometer band as the wavelengths range from ten to one hectometer. Frequencies immediately below MF are denoted low frequency (LF), while the first band of higher frequencies is known as high frequency (HF). MF is mostly used for AM radio broadcasting, navigational radio beacons, maritime ship-to-shore communication, and transoceanic air traffic control. High frequency (HF) is the ITU designation for the range of radio frequency electromagnetic waves between 3 and 30 megahertz (MHz). It is also known as the decameter band or decameter wave as its wavelengths range from one to ten decameters. Frequencies immediately below HF are denoted medium frequency (MF), while the next band of higher frequencies is known as the very high frequency (VHF) band. The HF band is a major part of the shortwave band of frequencies, so communication at these frequencies is often called shortwave radio. Because radio waves in this band can be reflected back to Earth by the ionosphere layer in the atmosphere – a method known as "skip" or "skywave" propagation – these frequencies are suitable for long-distance communication across intercontinental distances and for mountainous terrains which prevent line-of-sight communications. The band is used by international shortwave broadcasting stations (2.31–25.82 MHz), aviation communication, government time stations, weather stations, amateur radio and citizens band services, among other uses. The Tilted Terminated Folded Dipole or Balanced Termination, Folded Dipole (BTFD) - also known as W3HH antenna - is a general-purpose shortwave antenna developed in the late 1940s by the United States Navy. It performs reasonably well over a broad frequency range, without marked dead spots in terms of either frequency, direction, or angle of radiation above the horizon. A rhombic antenna is a broadband directional wire antenna co-invented by Edmond Bruce and Harald Friis, in 1931, mostly commonly used in the high frequency (HF) or shortwave band. Radio Netherlands Worldwide was a public radio and television network based in Hilversum, producing and transmitting programmes for international audiences outside the Netherlands. Radio Netherlands Worldwide also distributed content via web and e-mail technology from as early as 1992. The 80 meter or 3.5 MHz band is a band of radio frequencies allocated for amateur radio use, from 3.5 to 4.0 MHz in IARU Region 2, and generally 3.5 to 3.8 or 3.9 MHz in Regions 1 and 3 respectively. The upper portion of the band, which is usually used for phone (voice), is sometimes referred to as 75 meters. In Europe 75m is a shortwave broadcast band, with a number of national radio services operating between 3.9 & 4.0 MHz. ALLISS is a fully rotatable antenna system for high power shortwave radio broadcasting in the 6 MHz to 26 MHz range. An ALLISS module is a self-contained shortwave relay station that is used for international broadcasting. The National Radio and Television Administration (NRTA), formerly the State Administration of Radio, Film, and Television and the State Administration of Press, Publication, Radio, Film and Television, is a ministry-level executive agency directly under the State Council of the People's Republic of China. Its main task is the administration and supervision of state-owned enterprises engaged in the television and radio industries. 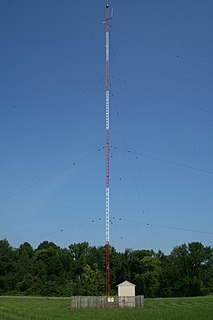 CKCX was the callsign used for the Canadian Broadcasting Corporation's shortwave transmitter complex near Sackville, New Brunswick at the Tantramar Marshes. The Sackville Relay Station was operated by Radio Canada International and broadcast its programming around the world as well as relay transmissions from several foreign shortwave broadcasters. Domestically, it transmitted broadcasts on 9.625 MHz to northern Quebec by CBC North, the James Bay Cree Communications Society and Taqramiut Nipingat, the Inuit communications society of the Nunavik region of northern Quebec. The CKCX designation was assigned after CBC Radio's CBA, under whose licence the Sackville complex originally operated, moved to Moncton in 1968. Sackville was also used by Radio Japan, China Radio International, Voice of Vietnam, BBC World Service, Deutsche Welle and Radio Korea as part of a transmitter time exchange agreement. A shortwave broadband antenna is a radio antenna, that without adjustment, can be used for transmission of a shortwave radio channel chosen from greater part of the shortwave radio spectrum. Some shortwave broadband antennas can even be used on the whole shortwave radio spectrum (1.6-30 MHz) which consist of the upper part of medium frequency (1.6-3 MHz) and the whole of high frequency (3-30 MHz). A true shortwave broadband antenna will work continuously across most of, if not all of the shortwave spectrum with good radiation efficiency and minimal compromise of the radiation pattern. An antenna array is a set of multiple connected antennas which work together as a single antenna, to transmit or receive radio waves. The individual antennas are usually connected to a single receiver or transmitter by feedlines that feed the power to the elements in a specific phase relationship. The radio waves radiated by each individual antenna combine and superpose, adding together to enhance the power radiated in desired directions, and cancelling to reduce the power radiated in other directions. Similarly, when used for receiving, the separate radio frequency currents from the individual antennas combine in the receiver with the correct phase relationship to enhance signals received from the desired directions and cancel signals from undesired directions. 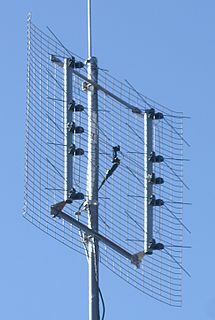 More sophisticated array antennas may have multiple transmitter or receiver modules, each connected to a separate antenna element or group of elements. In radio systems, many different antenna types are used with specialized properties for particular applications. Antennas can be classified in various ways. The list below groups together antennas under common operating principles, following the way antennas are classified in many engineering textbooks. ↑ "Archived copy" (PDF). Archived from the original (PDF) on 2012-01-27. Retrieved 2012-02-28.